Half-Speed Mastered Six Vinyl LP Box Set Celebrating 40 years of Outlandos d'Amour, release date November 16, 2018. 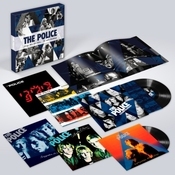 Every Move You Make: The Studio Recordings is a six vinyl LP box set which brings together The Police’s entire recorded studio albums, as well as a 12-track sixth disc entitled Flexible Strategies which contains exclusive bonus material of non-album recordings and B-sides. Re-mastered and cut onto 180-gram heavyweight vinyl at Abbey Road Studios by Miles Showell, the world’s leading exponent of half-speed mastering, this limited-edition set celebrates the 40th anniversary of the multi-million selling band’s first album, Outlandos d’Amour. It also contains a special 24 page, 12”x12” photo book featuring rare and unseen images from the band's personal archives housed in deluxe packaging of a hardcover box with lift-off lid. 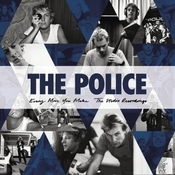 The Police’s studio albums include - Outlandos d'Amour (1978), Reggatta de Blanc (1979), Zenyatta Mondatta (1980), Ghost in the Machine (1981) and Synchronicity (1983). Formed in 1977, The Police are comprised of Sting, Stewart Copeland and Andy Summers. During their existence their contribution to the lexicon of rock was immense. The originality of their music fused elements from both punk and reggae to form a brilliant new style that can only be described as Music of the Police. They exist within their own genre. Having sold in excess of 50 million albums worldwide, The Police had phenomenal chart success and earned a multitude of accolades both public and critical, but they never allowed such peripherals to overshadow their commitment to the music itself. This collection features 14 U.K. and 18 U.S. Top 20 singles, including five U.K. and four U.S. single number ones and four U.K. number one albums and a number one U.S album.